“What If” histories are fascinating but misleading. Entries to the Chicago Tribune Tower competition (1922). L-R: John Howells and Raymond Hood (winner), Eliel Saarinen (second place), Bertram Goodhue, Walter Gropius and Adolf Meyer, Max Taut. In this short passage, Rybczynski imprisons the past in exactly the way Evans describes. First, Saarinen’s scheme for the Chicago Tribune wasn’t as forward-looking as he suggests. New York’s 1916 zoning law was already forcing designers to sculpt skyscrapers in similar ways, and Bertram Goodhue’s Tribune concept was similar but far less ornamented. The competition attracted hundreds of entries from international designers, including some of the most important early modern architects—Walter Gropius, Adolf Loos, Max Taut, and Bruno Taut, among others. Max Taut’s scheme preceded generic midcentury skyscrapers—notably Henry Dreyfuss’ Bankers Trust Building (1963)—by three or four decades, and Gropius’ design looks like any number of residential highrises being built today. LEFT: Tribune Tower as built, with Wrigley Building on the left. RIGHT: Eliel’s Saarinen’s design as it would look in place. But does foresight make these buildings better? The Tribune competition called for “the most beautiful office building in the world,” not the most prescient, which is why Saarinen’s scheme was a strong choice for second place. Arguably, by staking the middle ground between more embellished historical styles and minimalist modernism—pretty much the entire appeal of Art Deco—it was a perfect compromise between the competition’s backward- and forward-thinking proposals. No mean feat, that. But was it ahead of its time or exactly in line with its time? Rybczynski acknowledges that Saarinen’s design significantly influenced other architects, even though it didn’t get built, so it’s not at all clear to what degree it might have further “altered the history of the American skyscraper” if it had won the competition. And not winning may have given the design more mystique. In fact, sometimes the “unbuilt legacy” of architects, Rybczynski’s subject, are more inspirational than built buildings, which weather and age in the real world, drained of the apparent purity of the original vision. Zaha Hadid most definitely benefited from this fascination, since the first decade or more of her professional reputation relied exclusively on the expressive renderings of her unbuilt work. If alternative history is the exercise, what would have happened if Gropius or Taut had won the Tribune competition? Would they have hastened the eventual deadening of cities with ubiquitous glass boxes, which Rybczynski himself recently complained about? This certainly would have been the case if Mies van der Rohe had won the 1921 Friedrichstrasse competition. Rybczynski praises Mies’ “evocative crystalline glass cliff,” but, as I wrote earlier this month (“Architects’ Original Sin,” Architectural Record), the vision of an all-glass skyscraper set a course that became culturally and environmentally disastrous. Rockefeller Center, New York City. This gets to the real problem with Rybczynski’s parlor game. If Saarinen had won the Tribune Tower, Raymond Hood wouldn’t have, with at least two major consequences. First, Hood’s Tribune wouldn’t have been built, and Chicago would lose one of its premier buildings. After its construction, “Tribune Tower quickly became a major architectural and urban presence,” writes Chicago architecture critic Blair Kamin. “Along with the neighboring Wrigley Building and the Jazz Age skyscrapers at 333 and 360 N. Michigan Ave., it dramatically frames the Michigan Avenue bridge, helping define one of the city's great urban spaces.” One reason it received landmark status in 1989 was the “striking silhouette” of its “crowning tower,” a feature Saarinen’s blunt-roofed design does not have. 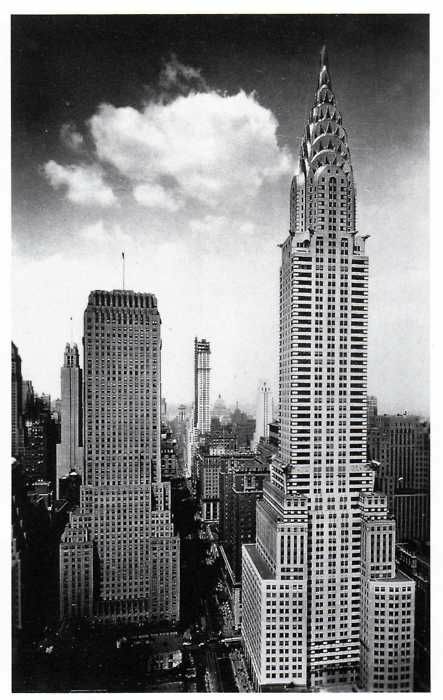 (The difference between the two is akin to that between the Chanin Building and the Chrysler Building in New York. For impact on the skyline, there’s no comparison.) Saarinen’s scheme may have inspired the design of other buildings elsewhere, but would Chicago have benefited from it replacing what’s there now? Second, Hood’s loss could have prevented him from going on to design New York’s RCA Building or any of Rockefeller Center, hailed by Paul Goldberger as “the nation's pre-eminent grouping of skyscrapers” and “the model that large-scale urban complexes should strive to follow.” So Saarinen’s win could easily have robbed both Chicago and New York of two of their great places. Which is a better measure of a building’s success—its influence on other architects or its contribution to the community? “One tiny change in the timeline,” says Evans, “leads inevitably to a whole series of much larger changes.” This is the rabbit hole we go down: an architectural legacy based not on what if but on whatnot, “any of various other things that might also be mentioned” (Merriam-Webster). Choosing one parallel path ignores the infinity of other possibilities, which is fun but ultimately futile—and, for architecture critics, potentially misleading. Dwelling narrowly on the legacy of designers gives the impression that architectural history concerns great men, not great places. The reader would be better served if critics focused less on the fate of architects and more on the fate of cities.